"Uncorking the Past: The Quest for Wine, Beer, and Extreme Fermented Beverages"
Patrick McGovern is the Scientific Director of the Biomolecular Archaeology Laboratory for Cuisine, Fermented Beverages, and Health at the University of Pennsylvania Museum in Philadelphia, where he is also an Adjunct Professor of Anthropology. He received his degrees from Cornell University (A.B. in Chemistry) and the University of Pennsylvania (Ph.D. in Near Eastern Archaeology and History). His areas of specialization include biomolecular archaeology, the archaeology of the Near East and Egypt, Bronze and Iron Ages, ancient medicine and DNA, organic contents analysis, pottery provenancing, and technological innovation and cultural change. 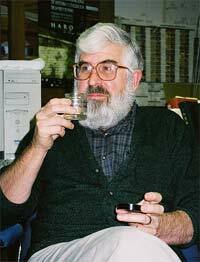 He has published ten books and over 100 articles, his most recent work is Uncorking the Past: The Human Quest for Alcoholic Beverages (2009, University of California).